4th Quarter - Down 1. Time getting low. You need possession. Pressure defense. Everyone, including the goalie, is locking off their man. You’re best pole is on the ball - as is you’re athletic, speedy LSM. Ball carrier splits the double and gets to the empty net. Unfolding at all levels of the game, the double team/Two-man Trap is an under appreciated facet of the game. 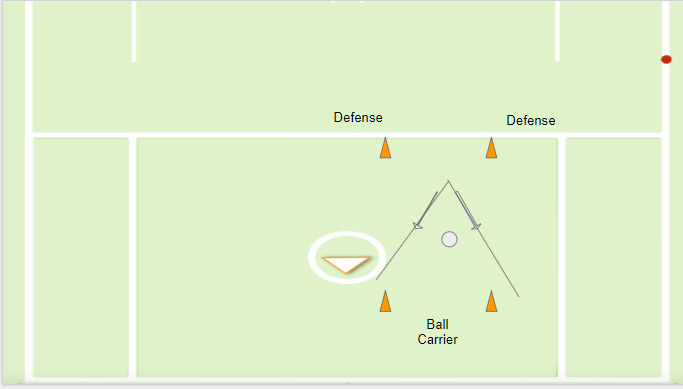 When implemented correctly, players can trap a ball carrier forcing a turnover and increasing gaining a possession. At its worst, two defenders end up out of the play as the other team is cruising towards your empty net. A great drill for instilling these strategies is the V Drill. It implements all the tenants above in a fun way that can be very handy for applying and handling pressure. Success happens when preparation meets opportunity. Take the time to prepare your players. The opportunity will arise to turn the tide in a game. Be ready for it. Hopefully, you’ve found these coaching tips useful. Let me know what you think in the comments.